Tamil movie star Vikram talks about coming to terms with stardom in the Hindi film industry. Perhaps it has something to do with the fact that he has his roots in the south Indian film industry where people are more polite than in Bollywood; or perhaps it's just because he is a newcomer. In any case, Vikram, basking in the success of his role as a drunk fisherman in David, is cordial and softspoken. His media manager has scheduled an insane number of interviews that have to be wrapped between 12noon and 5pm. If he is irritated with crammed schedule, he doesn't show it. For most part, he is jovial and has the 'buddy' air that most newcomers in Bollywood have. Yet, there is a certain amount of earnestness in Vikram that you cannot miss. When he speaks about his work the joking stops and he gets down to business. This isn't his first film in Bollywood. 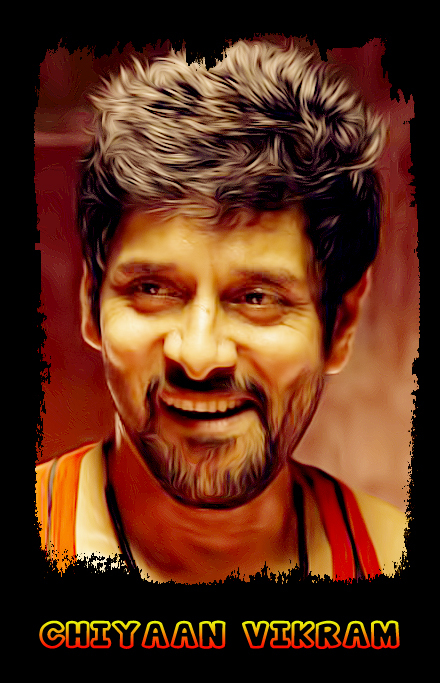 Like many before him, after having received tremendous success in Tamil cinema, Vikram hoped to carve a niche in Bollywood. His first outing was the disastrous Ravan where he played a second fiddle to Aishwarya Rai-Bachchan and Abhishek Bachchan. The film released, was tanked and Vikram's Bollywood dreams seemed all but over. Then David happened. Critics, audiences and those who matter in Bollywood largely had good things to say about him in the film that received only an average opening alongside Midnight's Children and Vishwaroop. Today, on a fine winter afternoon in a plush Mumbai suburb, Vikram is basking in the warm glory of his personal success as he settles down for this interview. Edited excerpts: Are you happy with the response that you are getting for the film? I am very happy I am getting a good response for the film. I didn't expect it. I knew there would be a good response when I signed the movie, but the way girls especially like my role, is really a pleasant shock for me. What kind of response did you get from the industry and fans? It is just four days since the release and I have already got five offers for films, so I think people have noticed my work. The movie is doing good in theatres too. I am used to this kind of fan following in Chennai, but Ravan had got mixed reviews and my character did not garner that much attention. So this is kind of new for me in Bollywood. I went to see the film in a theatre twice, once in Jaipur and once in Mumbai, to see audience reactions. It was nice to see people laughing the moment I came on screen and even before I do anything that is funny. I entered the theatre after the show started so that nobody could see me, only the person sitting next to me knew I was there and told me, 'you are cute'. I got three offers of marriage. I told them I was married. This is the first time I have got marriage proposals but it is because girls sympathise with my character. I am a loser in the film and they feel sad for me. In my other films I am a tough guy. The last time I met you, you said speaking in Hindi was like giving birth to a child... I did? It still is, only now it is a caesarean; somebody helps you deliver it. I am working with big banners and big directors like Shankar and Mani Ratnam, I get a wonderful script and I get paid as well as any hero here. So, I don't need to work here as money is not an issue. I want to do something that really gets me excited. I thought David was that kind of role where my character was significant. So many people have called me. I am sure there is some deadly film working its way towards me. What do you have to say about southern films remade in Bollywood? The new trend is masala films but I don't know how long it will last, maybe a year or two, or it may frizzle out in six months. Even earlier, Hindi cinema had lots of masala films and remakes from the south. A masala film helps to get Rs 100 crore, but then you still have Barfi! and Kahaani which were not masala films but still did good business. In Chennai masala films make lots of money but films like Barfi! and Kahaani will not make enough. They will be restricted to only cities, which is sad and which is why I say Hindi audiences have evolved. It is nice to work in films that cater to audiences who are tolerant of everything and open to any topic. David is dubbed in Tamil so what was the response you got there? It didn't do good business there because they don't understand the concept. Also, from the Tamil point of view, my screen time is very little. They are not able to comprehend why I am doing such a film. I knew it wouldn't work there. They wouldn't understand why the hero is punching a woman and wants to run away with his best friend's woman, why he gets slapped by every woman, the pace of the film...it's a different audience. Do you want to do films in Bollywood because it satisfies your creative urge as you mainly do masala movies? I don't do only masala movies. I do both kinds of movies. In the south too I do very hard hitting films. I played a person with a mental disability in Deiva Thirumagal, I did Pithamagan where I played a grave digger and I played a blind man in Thaandavam. Most of my films are performance-oriented. I do commercial potboilers like Samy or Dhool but even there I play a very strong character. I am looking at (Bollywood) as another language option. It has a bigger market and more people are going to see the films. I wanted to do David because it had an exciting plot and my story was very interesting (there are three different stories in David). If that happens in Bhojpuri or in Bengali, I am ready to do it. I am very happy with the way things are down south. What is nice (in Bollywood) is that directors are working on really good scripts. That is tempting. Also, there are lots of good directors and good stories happening. I have got lots of enquiries since David released -- at least five already. I have not heard the script but will do that soon. I am sure I will do lots of Bollywood films in future. What was the response after Ravan? After Aparachit (his first dubbed Tamil movie in Hindi) I got lots of offers, about 17, but after Ravan I got just three offers. But after David I am open to doing more Hindi movies as I am comfortable in Hindi. I am confident and can experiment with my roles in Hindi. So from Ravan to David, did you practice your Hindi? Not really. In Ravan I would be given dialogues just before the shot was taken and sometimes the whole scene would be just one shot, so it would be really difficult. With David I had my dialogues 10 days in advance so I knew my dialogues and I could concentrate on my acting. I had Karan Kashyap (who helped him in Ravan too) who helped me with my dubbing. He is amazing. He doesn't give up. He told me I was improving. You have only worked with South Indian directors in Hindi; is it because you are more comfortable working with them? Not really. I did Mani Ratnam's Ravan because he did not get anyone he was happy with. I did not want to do a role in a Hindi film but he said I should do it, it would be interesting. Bejoy (Nambiar) was working with Mani sir during Ravan and he told me about David. I did not pay much attention but when I saw Bejoy's Shaitan, I was bowled over. I called him and asked him if he still wants to do David because I was now ready. Neil's character had a poetic slant. If I was given the choice, I would have loved to do all the three characters. In fact, I told Bejoy to let me do all three even though he had already shot Vinay Virmani's character. Even Neil wanted to play all the three Davids. I would have done all the three roles showing different physical traits for all three. It would be interesting for any actor to do all the three roles. Though there are three different Davids and three different stories, we never share each other's space or scenes in the film; the three never meet so we have different tracks. In my story, once I come in, my story travels with me, it is just about me. I found that very interesting. You haven't done a full-fledged role in Hindi movies, not in Ravan nor in David. I would rather do a role like this, which gives me recognition, than do ten films playing a solo hero which doesn't have the same impact. People will always say I am a south (Indian) actor, (and wonder if) I will be able to do a Hindi film. But after seeing David, people will know that I can handle a Hindi script and I can do a good job. What was the difficult part of the movie? Diving into the water in the first scene was very difficult. I am not very comfortable with diving into the sea. I was nervous and uncomfortable. They did the shot with someone else and I didn't like the dive, so I said I would do it. In the first take itself I did an okay job. But I dived three more times. Other than that, the role was so much fun.